Steve’s breakdown: Back in March we told you that MOD Pizza had to grow-up and now with this new CMO, it seems they took our advise. No time better than now to join their team. BELLEVUE, WA: MOD Super Fast Pizza Holdings LLC has named Tracy Cioffi as chief marketing officer, the company said on Thursday. MOD Pizza also named Dunkin’ Brands Group Inc. executive Kate Jaspon to its board of directors. Cioffi will lead global marketing strategy at the Seattle-based fast-casual pizza chain, which has 252 locations in 24 states and the United Kingdom. She is MOD Pizza’s first CMO. “With the addition of the CMO role, we are adding to our marketing operations, and I am confident that Tracy will ensure that MOD’s people-first culture and our commitment to making a positive social impact is evident in all facets of our business,” said Scott Svenson, who founded MOD Pizza with his wife Ally in 2008, in a statement. Cioffi was most recently senior vice president at Sur La Table Inc., where she managed marketing for the company’s 130 stores and 75 culinary locations. She was previously head of marketing for See’s Candies Inc.
Jaspon has been with Dunkin’ for 11 years, and is currently the company’s chief financial officer. “Kate’s deep financial and leadership expertise will be a welcome addition to our board,” Svenson said. 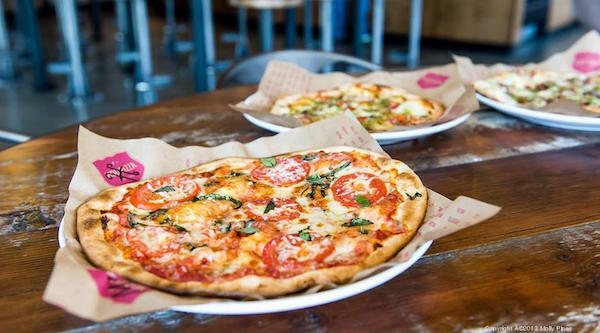 MOD Pizza is battling Blaze Pizza for supremacy in the rapidly growing fast-casual pizza niche. “Tracy and Kate join the MOD team at a critical point in our growth,” Svenson said.